Biopsy is recommended for patients who present with irregular or growing amelanocytic lesions on the hands or feet. This case report illustrates the importance of obtaining skin biopsy of a changing or atypical lesion on the acral surfaces of the hands or feet. The case is published in Dermatology Online Journal. Acral lentiginous melanoma (ALM) and amelanocytic melanoma account for less than 5% and 2% to 8% of all melanomas, respectively. 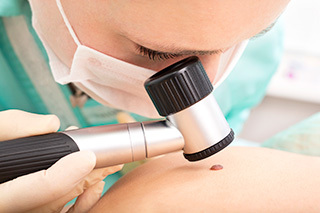 These lesions are often misdiagnosed as other clinical entities as they may present as pink or red nodules, and the differential diagnoses for ALM include wart, verrucous carcinoma, and eccrine porocarcinoma. Risk factors for ALM are not clearly defined. The patient was a 50-year-old man who presented with an approximate 20-year history of a skin-colored plaque on the plantar surface of his right foot. Five years prior to this presentation, the patient reported that the lesion became pink in color and started to grow, at which time he was unsuccessfully treated by a podiatrist for a wart. The lesion was a 2.8 × 1.9-cm pink, firm, hyperkeratotic plaque, without pigment or a vascular pattern. Following histopathologic examination, the lesion was diagnosed as an amelanocytic ALM, with a Breslow thickness of 8.3 mm, Clark level V, with 5 mitoses/mm2. The disease was staged as IIIC (T3N3) following wide excision and lymphadenectomy. The patient initially underwent treatment with adjuvant interferon-alpha therapy, followed by a treatment hiatus of 2.5 years. Nivolumab was initiated after surgical excision of additional lesions which developed on the foot and right thigh, and the patient was reported to have stable disease. The authors recommend clinicians consider skin biopsy of any irregular or growing amelanocytic lesion on the hands or feet to confirm the diagnosis. Okhovat JP, Tahan SR, Kim CC. A pink enlarging plaque on the plantar foot: amelanotic acral lentiginous melanoma. Dermatol Online J. 2019;25(1):11.